v-stitch – in stitch indicated, 1 dc, ch 1, 1 dc. The beginning chain should be a multiple of 36 plus 2. Row 1: V-stitch in 5th ch from hook, v-stitch in next ch, skip 4 ch, v-stitch in each of next two ch, skip 4 ch, v-stitch in next ch, dc in next ch, skip 4 ch, dc in next ch, v-stitch in next ch, (skip 4 ch, v-stitch in each of next two ch) twice, **skip 1 ch, dc in each of next two ch, skip 1 ch, (v-stitch in each of next two ch, skip 4 ch) twice, v-stitch in next ch, dc in next ch, skip 4 ch, dc in next ch, v-stitch in next ch, (skip 4 ch, v-stitch in each of next two ch) twice. Repeat from ** across to last 2 ch, skip 1 ch, dc in last ch. Turn. Row 2: Ch 4, dc in first dc, skip 1 dc, (v-stitch in each of next two dc, skip 2 dc) twice, v-stitch in next dc, skip 2 dc, v-stitch in next dc, (skip 2 dc, v-stitch in each of next two dc) twice, ** skip 1 dc, v-stitch in each of next two dc, skip 1 dc, (v-stitch in each of next two dc, skip 2 dc) twice, v-stitch in next dc, skip 2 dc, v-stitch in next dc, (skip 2 dc, v-stitch in each of next two dc) twice. Repeat from ** across to last dc and turning ch, skip 1 dc and v-stitch in top of turning ch. Turn. Row 3: Ch 3, v-stitch in first dc, (skip 2 dc, v-stitch in each of next two dc) twice, skip 2 dc, dc in each of the next two dc, (skip 2 dc, v-stitch in each of next two dc) twice, ** skip 2 dc, v-stitch and dc in next dc, dc and v-stitch in next dc, (skip 2 dc, v-stitch in each of next two dc) twice, skip 2 dc, dc in each of the next two dc, (skip 2 dc, v-stitch in each of next two dc) twice. Repeat from ** across to last 2 dc and turning ch, skip 2 dc, v-stitch and dc in third ch of turning ch. Turn. Row 4: Ch 4, dc in first dc, v-stitch in next dc, (skip 2 dc, v-stitch in each of next two dc) twice, skip 4 dc, (v-stitch in each of next two dc, skip 2 dc) twice, ** v-stitch in each of next 4 dc, (skip 2 dc, v-stitch in each of next two dc) twice, skip 4 dc, (v-stitch in each of next two dc, skip 2 dc) twice. Repeat from ** across to last 3 dc and turning chain, v-stitch in last dc, v-stitch in top of turning chain. Turn. Row 5: Ch 3, v-stitch in second dc, v-stitch in next dc, skip 2 dc, v-stitch in each of next two dc, skip 2 dc, v-stitch in next dc, dc in next dc, skip 2 dc, dc in next dc, v-stitch in next dc, (skip 2 dc, v-stitch in each of next two dc) twice, **skip 1 ch, dc in each of next two dc, skip 1 ch, (v-stitch in each of next two dc, skip 2 dc) twice, v-stitch in next dc, dc in next dc, skip 2 dc, dc in next dc, v-stitch in next dc, (skip 2 dc, v-stitch in each of next two dc) twice. Repeat from ** across to turning chain, skip 1 ch, dc in third ch. Turn. Thank you for sharing another wonderful pattern! You are both talented and generous. hello and Happy New Year to everyone. i’m new to this site as of today. i just want to say, Miss you’re awesome and my co-workers and i wish you lived near D.C.
keep up the wonderful work. i’m still in the learning stage, i donate my afghans to hospital for sick children and i give them to my friends who have babies on the way. You are a master at your craft! I’ve just come across your site and am entralled. I have made numerous afghans which I’ve donated to Boggy Creek Gang and Salvation Army. It is always a plus to find new patterns to vary the job. Thank you. This is the best set of directions I have ever seen. All my questions were answered. Thank you. What colors did you use in this blanket? They would be perfect for my daughter n laws Christmas gift. Yes I am making my daughter and both daughter in laws blankets for Christmas. I haven’t started on any because I have been looking for the right blanket and this will be perfect for one of them. This is Knitting Fever King Tut yarn, which just has numbers for the colors, so I don’t know the color names, but the numbers are 8590, 1874 and 477. I love this design. I have just mastered the basic ripple pattern, and can’t wait to start on this one. Thank you for sharing your amazing talent with all of us who can only follow directions. I so admire God given talents such as your and all members of the art world. do you have a chart for the double v afghan? I find it easier to work with charts than written instrucions. Thank you for the chart. I try to chart patterns, but it never works for me. Since the weather changed and school is in session my idea for fund raisers is to make small items, caps, sock, gloves, mittens and/or scarves in the school colors. Many schools have a school spirit day and the students are encouraged to wear their school colors, most people are not willing to spend the money for clothes that may not be worn very often, but these small items should be something people need and will use. thank you for always generously giving us free pattern instructions. I love ripple afghans and chose this one to make as a wedding gift for my niece…..it will be striped since I will be using the bride’s favorite colors with a row here and there of the groom’s favorite color. I can’t wait to finish and see how well it turns out …..will post a photo on Ravelry. Thank you again….and Happy New Year everyone!! Your BLOG is fantastic..Such clear & concise instructions…Love the avail. options to knit/crochet various sizes..
May I ask if this pattern is suitable for Red Heart Soft Worsted Weight? It would do great in that. Thanks for sharing this beautiful pattern. Unfortunately I download the DoctoPDF thing to print it & now I’m getting a ton of popups. If anyone is thinking about downloading the pattern that way, please don’t. Firstly, I’m very sorry you’re having trouble. Unfortunately they also include 3rd-party advertisements all over the print preview and download forms that appear, and it looks like you accidentally clicked on one of those ads and downloaded something terrible. You’ll be safe with always clicking the “Download Your PDF” button at the upper-left of that final window and ignoring any ads that appear beneath it. I see the DocToPDF ad running now has “DOWNLOAD” embedded in its image, which is terribly misleading. We’re still looking into alternatives, including the commercial version of the PrintFriendly service, and will let you know what we’ve settled on. Sorry again for your trouble. I just bought “I Love This Yarn” for a different project. It’s 100% acrylic. Would it work up well for this pattern or would it be too heavy and bulky? That should work great. I recommend using the size hook recommended on the yarn. This pattern is flexible with weight and type of yarn. Beautiful pattern but I didn’t think it was EASY easy. DITTO, DITTO, DITTO — EVERYTHING ABOVE. You are SOOOOOO awesome. Talent beyond measure. Every time I see a pattern I love, it turns out to be YOU!!! Not only are your patterns absolutely GORGEOUS, but you give different SIZES. I would give my BEST crochet hook if all patterns came that way! I can’t figure out multiples and I like to make afghans really big so maybe even more than one person can wrap up in one. Thank you so much!. Beautiful beautiful I want to try this so bad thank you for the pattern. Beautiful pattern!! I’m left handed and cant seem to get pattern to come out right!! Ive had this problem before. (haha)..this is the double-v-stitch-ripple blanket..
any suggestions will help. does the turning chain count as a double. also on the repeats I never get to the end of it as I finish!! thanks for any help you can give me. Love the pattern am doing it in three shades of taupe!! The turning chains of 3 count as a dc and of 4 as a dc and ch. In my directions you don’t have to know that specifically because I only say dc for an actual dc and refer to chains for chains. The “peaks” and “valleys” might be the problem area. They should always align from row to row. Also the v-stitches in the panels between the peaks and valleys will always be made in the two dc that are where v-stitches from the prior row are together. You can send me a picture and I can see if I can see a problem. unfortunately the chart does not come up and i am not able to get the hang of how to do the pattern from the written form. can you please help! Is there a “best place” to make color changes on this one? Should you keep rows 2-5 the same color? Or does it matter? The way the eyelets flow on this one, you can make color changes on any row. Because of the way my yarn worked out, I actually make stripes of 11 rows, so my color changes did not coordinate with the repeats. I’m a beginner crocheter. I say that because I have a question about row 5 and I’m sure it’s simple but I just got thrown a little when it says in the instructions to skip 1 ch. All the way through rows 1 through 4 it’s been all double crochets (except for the chain in the middle of the v stitch). All instructions have been v-stitch or double crochet and skip 1 or two dc. I have not made any chains except as I said the ch in the middle of the v-stitch. So in row 5, what chain am I skipping? The first “Skip 1 ch occurs right after the “**” in the instructions. Thank you for your help. I don’t know why I said to skip a chain at that point and not in other places. I didn’t include those consistently. In other rows you have been skipping ch 1, but I’ve only been noting the skipping of the dc stitches. Saying to skip the ch-1 is more correct, but just not consistent with my other rows. If you have not have trouble following the other rows, you can just ignore those skip ch instructions and be just fine. I’m sorry about my inconsistency in the pattern. 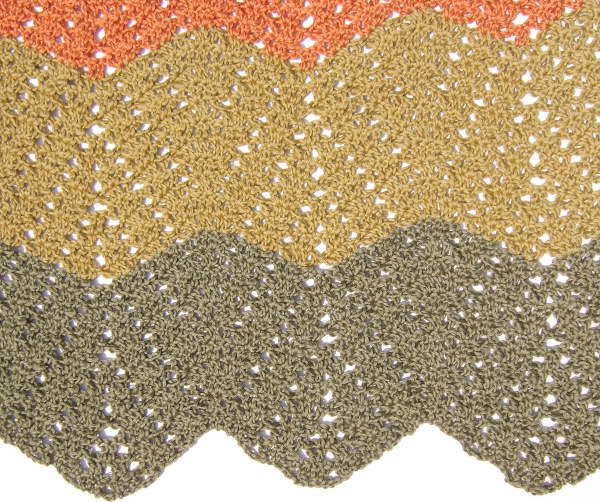 Can a person use the bernat baby blanket yarn which is a bulky type yarn. That would work great. It would be bigger than my chart measurements. I would recommend using the hook size suggested on the yarn. I love the pattern but I am confused by the instructions to skip four chains. Is this simply skipping 4 or is it chaining four and skipping four chains?